What follows is a much shortened transcript of our podcast discussion. Enjoy! DAN: Thanks for joining us guys. I’m going to start with you Steve, can you tell us what Urban Workbench is and what you do? 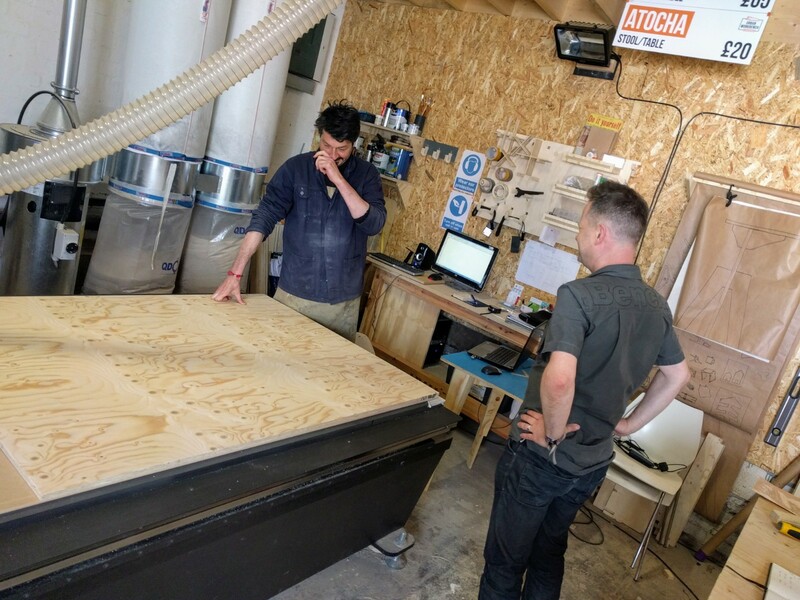 STEVE: So Urban Workbench is a project and facility that’s been set up by a Community Interest Company I’m co-founder of called We Make Places. We Make Places works with communities, neighbourhoods and voluntary organisations, typically across North Liverpool. Our remit is to work with communities to give them the tools and the confidence to engage in decision making about their neighbourhoods and within their city. Urban Workbench is a specific focus within that. 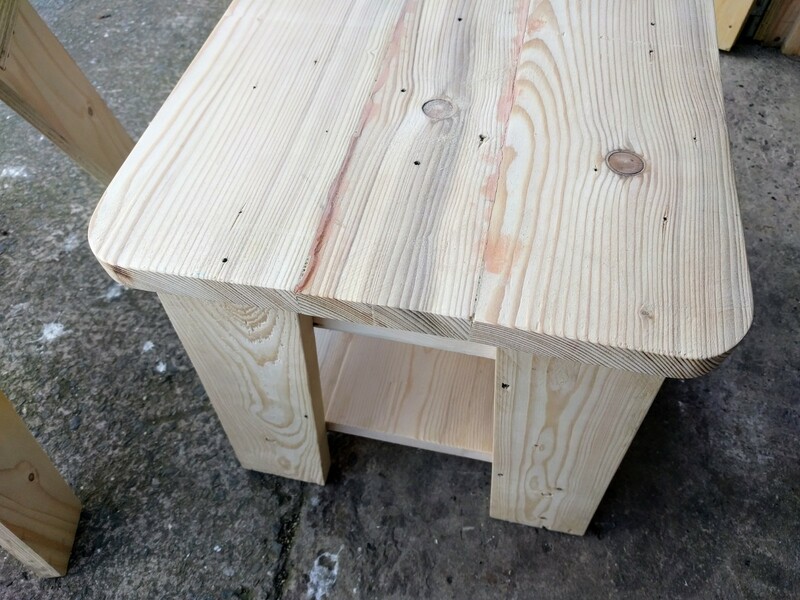 Urban Workbench is lead by a learning programme, learning through making and construction. It’s not a vocational course. People learn skills of DIY and basic joinery but rather than say we want to hit job targets it’s actually about building people’s self confidence, and the confidence of their communities as well. It’s about dealing primarily with issues of social isolation. I’m not saying people won’t get jobs through this programme but that’s not our driver. If it were I think we’d be failing in the remit we set out to do. Now in terms of the workshop you’re in today, you’ll notice we have a very interesting machine in the corner. A digital CNC router. What I mean by that is a machine that’s programmed to cut through sheet materials and do it at speed. We primarily use plywood. So it can take a digital file and produce anything from small accessories and coat hooks to small buildings, and we’re working on projects across all of those. Some of our focus at the moment is on furniture and this will be visible at MakeFest. We’re using robust but modest materials to co-design furniture with people, typically for those in social housing. In a situation where they can’t afford to purchase furniture of their own. Also people transitioning out of homelessness. We’ve been developing components that meet that need but we want the products to be attractive and appealing to everyone. We want them to be bought by members of the public. We want them to be aspirational to people with money as well and that’s really important for us. If we’re specifically just providing furniture to people in social economic difficulty then we start to stigmatise and institutionalise that market. So why this machine exists is unashamedly to generate money in order for us to do the work we do. Angelo (left) and Steve (right) at the CNC machine. DAN: So that’s interesting, you’re selling these products. Sustaining these kinds of projects can be a real challenge but you’ve got courses and products to sell on top of funding and other income. Does diversifying help sustain what you do? STEVE: I think it’s really key as a social enterprise that we’re not ashamed about making money. We Make Places (the parent organisation) gets hired for consultancy by charitable organisations, housing associations and also quite recently NHS trusts. All about engaging people in decision making in their own places. So that is another income stream but it’s really important we aren’t too heavily reliant in the long term on core funding for our services. I don’t think that’s necessarily sustainable, that’s going to shrink over time with more and more people in need of it. What’s really interesting is I’ve noticed over the last 5 years there’s a massive culture of social enterprises in the North West doing amazing things on the ground. I think we all have to find answers as to how we sustain ourselves financially and not be ashamed of the enterprise part or social enterprise. DAN: One of the things I’ve noticed around Liverpool and I’m sure many people have, is every community building or project seems to have a sign on the side which reads “Paid For By The European Regional Development Fund”, obviously that’s going to go away fairly soon. Is that a concern at all? STEVE: For me it’s less of concern economically and more about issues we have as a community across Europe. We’re fortunate through myself and also my colleague Kate Stewart to be part of a number of very dynamic networks across Europe. I’m hooked into an organisation called the European Cultural Foundation. We’ve received research and development funding through them which has actually helped to instigate this project, but more importantly I’m now part of an extensive network throughout Europe. We’ve got great partners in many countries. Most notably for myself in Spain. We share knowledge and we’ll continue to do that even as this island becomes more isolated. Yeah I’m concerned outwardly about how things will affect us culturally more than anything. DAN: Ok so I’m gonna turn to you now Angelo, you lead the learning programme. Tell us a bit about that, how many people do you get on a course and how does it work? ANGELO: For each course we discuss basically what kind of DIY course we want to build and yes we have a limitation on numbers because we also want to give everyone a safe working environment. So they’re not restricted to a specific area, they can work and it’s safe. So let’s say between 6 and 8 people typically in the workshop at any one time. The programme is built on very simple basic projects. DIY projects like building with palettes. We also try to use recycled materials, often donated by the local community. We’ve got fantastic support from everyone in that. They are 6 to 12 week courses where each single lesson is 3 hours. People who come learn an approach from how to plan a project, to how to build. So they get an idea of how to start planning for anything they want to do in future. Also the programme is interesting because it can be shifted from something they need for themselves to something that can really be implemented within their community as an object or as a piece of furniture maybe. So it interacts with the community. We have 2 courses at the moment, we just finished one and the work they came up with is fantastic. The people really enjoyed it. The amount of attention each individual put into their work, you could really see them enjoy planning and making whatever they had in mind. DAN: Do they go on to sell stuff they’ve made as well maybe? The table Steve was showing me. Made by a participant from palette wood. Another photo of that table Steve mentioned. STEVE: So answering your question as to whether things are for sale. It’s more about making their own personal objects. Angelo’s already talked about installations that benefit the local community. 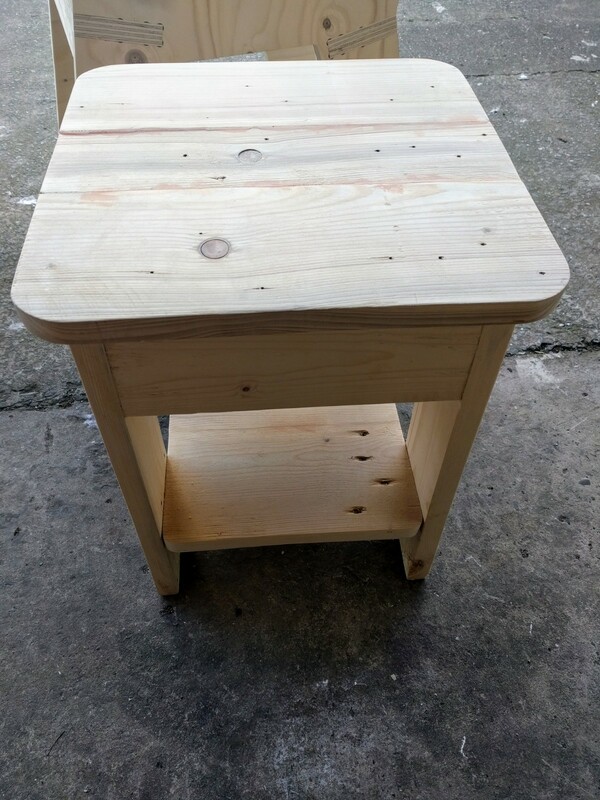 This table was made by one of our recent participants. This is palette wood that it’s been made of, it’s got beautiful hidden joints and looking at it you’d never suspect it’s original humble beginnings. What’s so interesting in the way Angelo works and the courses he’s created, is the amazing things it brings out of people in terms of talents. If we say ask people to design a piece of furniture from a palette you’ll find that none of them look the same. It’s not like DT (design technology) lessons at school, or my DT at school should I say, where you get a template and you’re told we’re going to build this over so many weeks. Angelo’s way of working really brings out everyone’s unique skills and accommodates everyone’s way or working, or rate of work, but everyone did complete their project by the end. Everyone had unique outcomes. This is really about giving people self-confidence and establishing that over just some proprietary vocational or hobby course. DAN: Yeah so they get to express their own personality in the things they create as well which is great. Do you get people at very different levels of skill coming in? Some who know a bit and some who’ve never attempted this before. ANGELO: Yes, we had people at different levels. Each of them will apply their own skills according to the confidence they have when putting their hands on the material but also depending on the context. We try to make everyone feel free to express themselves. Most of the time you may get someone who does have the skills but doesn’t want to show them off. It would be of benefit if that person could share their own skills with the others, it can be a big support to the course. This is what we’re aiming for really. To see if people who do have some skills can feel free to take them out, feel free to share it. So eventually you end up with not just you showing them how to make a specific joint but others in the group also helping. Sharing knowledge about things. This is one of the most amazing achievements I think we can get out of people when they come to the workshop. So the student can become the master almost you know. STEVE: But it’s not daunting. For anyone listening and thinking “oh god there’s gonna be some really skilled people in there, I can’t embark on this course”, it’s not like that. We should also say that although we target people in certain social economic situations the courses are available to everyone. To subscribe and pay for if they want. So we have a real mix but no matter where people are coming from we create a supportive environment and nobody should feel daunted. We really believe anyone can get up to speed pretty quickly whatever their starting point. DAN: So the well-being side of things which I know is something you really focus on. Just doing something, learning skills and making things can be so rewarding and you must see that in people. Is that a big bonus for them? ANGELO: Well you mentioned the word well-being which links quite well with enjoyment and achievement. This is supposed to be the actual word used in secondary school, when the kids are at that age where they should really get as much as possible from that 3 years of compulsory skills learning. Whatever happens in art and design and technology in secondary schools it really doesn’t work the way it should. Why? Because there is not much money invested in these skills by schools. So most of the kids will never really get passionate about making things because they never do enough to get passionate. I worked 9 years in a secondary school and I really think when you put a lot of effort and a lot of passion into the subject the kids get passionate about it. DAN: Yeah it feels like a kind of box ticking culture in some cases with education at times. The kids have done X Y Z now get them out the door, the focus should be more on making rounded individuals… anyway, I’m answering my own questions now sorry <laughs>. STEVE: That’s ok, it helps us. DAN: So getting onto Liverpool MakeFest then, the reason I’m here in the first place. What will you be doing and what can people expect to see there? STEVE: You’ll be able to see a number of examples of the work we do with machines. So the physical workshop will be upcycling palette materials to make bird boxes. They’ll also be able to see the things we make at different scales. Anything from the stools and chairs we’re using now to other objects and even a small portable room called a speak-easy. That will have a role at the event possibly as a vox pops booth or a space for discussion. Both myself and Angelo will be there to chat if people want to know more about what we do or perhaps even get involved. DAN: Excellent, that leads me to the final question which is how can people find out more and perhaps get involved? STEVE: Sure, visit our website at urbanworkshop.org or email us via info@wemakeplaces.org and it’s not one of those anonymous never checked emails. We just have one inbox which between us we all check, so it will get a response. I think most importantly meeting us and coming to chat is a big reason we wanted to take part and contribute to MakeFest. So people can see what we do and meet face to face, ask questions and get involved. DAN: It sounds great and we can’t want to see you there. Saturday June 30th 2018 at Liverpool Central Library. Thanks very much for giving up some of your time to have a chat with us. STEVE: Thanks Dan, we’re looking forward to it too. So there you have it, what a great interview. I was so impressed by the workshop and what the guys had to say. The photos don’t do it justice so head to their website if you’d like to find out more, or come along to Liverpool MakeFest and say hello. That interview was slightly longer than normal but I really could have talked all day, no surprise there I know. A big thank you to Steve and Angelo for giving us some of their time. Don”t forget there’s even more discussion on the audio podcast! This was only a shortened transcript, so grab the FULL AUDIO PODCAST and you could even SUBSCRIBE with the handy widget on the page. You can hear me bust out the Ghandi quotes as we get philosophical, I recommend listening. Grab some tickets for MakeFest to help us gauge numbers and also sign up to volunteer if you’re able, we really do appreciate it! I’ll be back chatting to another Maker next week, so until then take care and don’t forget the sun cream with the current weather.